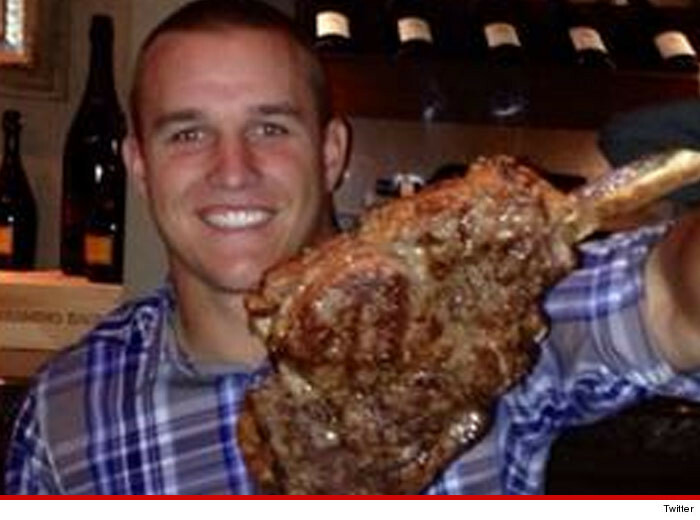 Mike Trout THOUGHT he could take down an entire 58 ounce mega-steak by himself. You've probably seen the pic ... Mike and Los Angeles Angels teammate Garrett Richards celebrating Trout's new $144 MILLION contract extension with a massive steak dinner. Now, we know it all went down at The Ranch restaurant in Anaheim on Saturday night -- where Mike chowed down with his entire family in a private dining room. Our carnivorous sources tell us ... Mike and the gang got the total V.I.P treatment Saturday night -- with executive chef Michael Rossi personally cooking the $89 steaks. Trout and Garrett made a friendly wager about who could finish their steak first ... but we're told they only made it about 3/4 of the way through before they both threw in the towel. The good news ... we're told Mike boxed up the rest of the meat and said he was gonna make steak and eggs the next morning. Can't let good food go to waste ... even when you got $144 million.